The Neo series consists of 2 programmable battery chargers with 8A and 10A charging current respectively mean for 12V and 24V battery systems. The 2 models are delivered in a robust aluminium cabinet with handle. 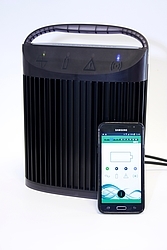 The products are programmable and can therefore be adated to basicly all battery types, and at the same time it is possible to store and read out charging data for further processing via a smart phone app.